Great for heavier saltwater applications, these powerful, high-performance reels feature a classic design with tough molded side-plates and 2 chrome-plated brass rings with chrome-plated frame posts. Equipped with precision machined stainless steel gears and spool spindles, Penn star drag, a comfortable torpedo handle and quality HT100 drag washers. Made in USA. 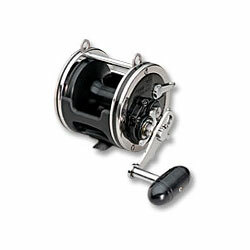 "These reels are perfect for heavy saltwater applications where they may be exposed to sand and sea. I use these reels exclusively for land-based shark fishing and routinely submerge them in saltwater and drag them through the sand without hampering their performance. "